A total of 20 hatchlings of Painted Terrapin (Batagur borneoensis), an endangered species, released back on to the original habitat, Tamiang River, District of Aceh Tamiang (12/08/2015). According to the IUCN, Painted Terrapin (Batagur borneoensis) is a critically endangered species and listed in Top World’s 25 Most Endangered Turtles at the Global Level. In Indonesia, this species is also listed as high priority according Minister of Forestry Decree Number 58 of 2008 on the Strategic Direction on National Species Conservation 2008-2018, although is not pretected yet by Government Regulation Number 7 Year 1999 on Preservation of Animals and Plants. Currently, this regulation is being revised. Of a total of 20 hatchlings released, three of them were equipped with a UHF radio transmitter. The transmitter is used to track the movement, range, survival of hatchlings in the river after released. The transmitter can emit the signals, approximately for eight months, so the behavior of post-release hatchlings can be traced and investigated. This study never conducted before. 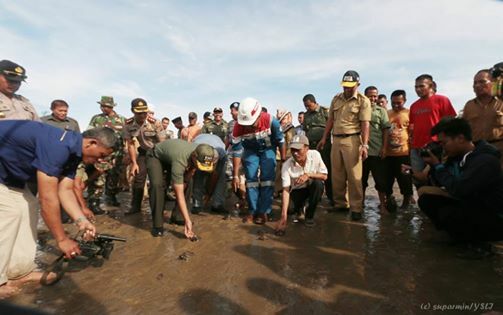 Regent and another public leader in Aceh Tamiang release Painted Terrapin into river. In delivering a speech at the releasing event, the Regent of Aceh Tamiang invites coastal communities to protect the survival of that critically endangered species on habitat, so the extinction as happened in many places in indonesia can be avoided. Regent also invites the village government officials to actively disseminate the local regulation on preservation of this species to their community. “We hope that in the future, this location – mangroves, beaches, rivers – can be developed as the location of marine, educational tourism destination in Aceh Tamiang”, said Ir. Agustin, Chief of Aceh Tamiang Fisheries Office. The releasing ceremomy was attended by the Regent of Aceh Tamiang, Hamdan Sati, ST, accompanied by Chief of Aceh Tamiang Police, AKBP Yoga Prasetyo, Commander of Aceh Timur Military District, Lt. Col. (Inf) Endra Syahputra KZR SE, M.Si, Chief of Marine and Fisheries Office Ir. Agustin, Chief of BKSDA Aceh Section I, Dedi Irfansyah, ST, Field Manager of PT Pertamina EP Field Rantau, Agus Amperianto, Chief of Forestry and another local stakeholders and villagers around the habitat. At the same time, Joko Guntoro, program director of Painted Terrapin Conservation at Satucita Foundation, hoping these preservation activities can be continuously conducted in the future and hoping the multi-party cooperation at local, national and global scale to conserve this species. This is due to the fact that Aceh Tamiang is very possible to be the last stronghold for wild population. According to several surveys that have been conducted by researchers in recent years, the species is likely to have been extincted on the east coast of Sumatra, except in District of Aceh Tamiang and District of Langkat. “If the minimum number of viable population required – accroding some researches on vertebrate species that taking into account the genetics diversity – is approximately about five thousands individuals, so the population in Aceh Tamiang is not secured due to it is estimated only four hundreds of individuals left in the wild” said Guntoro. Currently, Aceh Tamiang has proposed a local regulation to protect Painted Terrapin and habitat. They are also would like to make this species become their mascot. The local government has been built a captive breeding facility and expected can be operating soon. The aim to improve the habitat as educational tourism forest is also under planning. At the same time, also planted Coconut and Mangrove tree by public leader and villagers.